A love for needlepoint can begin at any age. Exposing children to the art of needlework can be the start of a life long passion. Just such a start may have begun at the CARON Collection. One day at the CARON Collection an employees children, Cynthia and Crystal, were visiting their Mom. They were fascinated by a piece of needepoint that Lois Caron was working on. 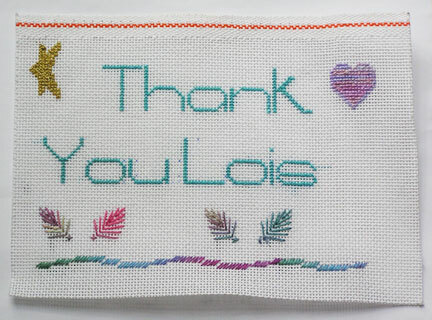 The two helped Lois choose colors and expressed a real interest in learning to stitch. A deal was made. They all agreed that if Lois would teach them to needlepoint one afternoon a week during the month of August they, in return, would do one hour's work helping to wind and label yarn at the CARON Collection. 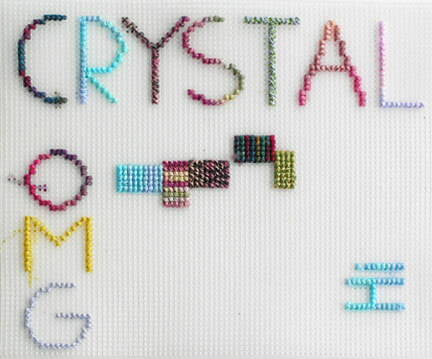 Cynthia and Crystal were dream students and picked up the nuances of needlepoint and cross stitch instantly. 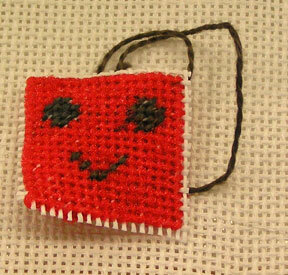 After the first lesson, they went home and taught their Dad how to stitch (see Dad's work below). All of the stitched pieces shown have been designed and stitched by the girls without Lois' supervision. 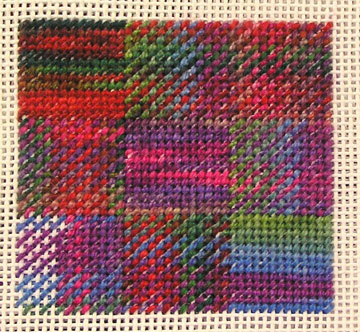 The pieces were worked on 7 count and 10 count plastic canvas and on 13 count and 18 count needlepoint canvas. 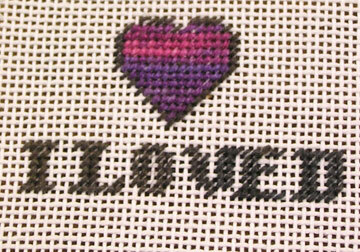 Cynthia also completed a greeting card done on evenweave fabric. After Lois showed Crystal how to do the leaf stitch (http://www.caron-net.com/jul99files/jul99kid.html), she went home and made an ornament for Lois and every one of the CARON Collection's employees. The smiley face was designed by Crystal and the one shown helped Lois quickly identify her luggage on her recent Balkans trip. The one she did for her Mom is a tag for her cell phone. Crystal also came up with some really innovative combinations of thread -- Watercolours threaded through Rachel, which she used to stitch the ornaments, and Watercolours and Snow in the same needle -- a really neat effect. 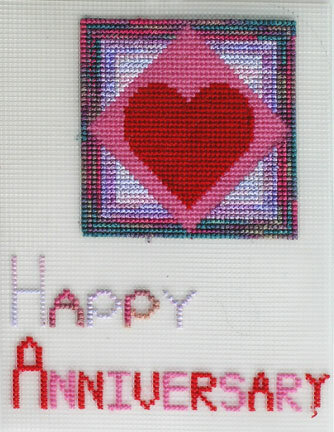 The thank you is from Cynthia, as is the heart (shown at the top of the page) which she stitched as an anniversary gift for her parents. Both girls made Christmas gifts for all their friends and relatives. We encourage our visitors to introduce the children around them to crafts and needlework. It can help develop a child's self confidence, it servse as a creative means of self expression and it can provide a wonderful hobby and career path. Please browse through out Kid's Porjects section for many great ideas on how to get started.